The U.S. economy lost 40k jobs in the month of September but instead of falling, the greenback enjoyed strong broad based gains this past week. USD/JPY broke above 113 and hit its highest level in nearly 3 months. It gave up those gains on reports that North Korea could conduct a missile test this weekend but the fundamentals supporting the greenback have not changed. U.S. data was better than expected and Federal Reserve officials still plan to raise interest rates. While the impact of the hurricanes on payrolls was more significant than economists anticipated (they were looking for 80K job growth but instead saw -33K job losses), investors quickly discounted the headline number in favor of the upward revision in August, the strong 0.5% rise in average hourly earnings and the lowest unemployment rate since 2001. While the dollar retreated from its highs on reports that North Korea could test missiles this weekend, there’s no refuting the strength of Friday’s jobs report. These better than expected numbers reinforce the Fed’s hawkishness and helped drive up expectations for a year-end rate hike to 77% from 70% one week prior. Just like in 2005 after Hurricane Katrina, everyone is looking for payrolls to be revised higher and rebound next month. With manufacturing and service sector activity accelerating and wage growth rising, we expect the dollar to extend its gains in the coming week. The FOMC minutes scheduled for release on Wednesday should be hawkish and with gas prices rising and wage growth increasing, economists are also looking for a very sharp recovery in retail sales that should take USD/JPY back to its highs near 113.50. Technically however we have to respect the reversal in USD/JPY. Friday’s candle was an ugly one that typically points to a deeper correction ahead. 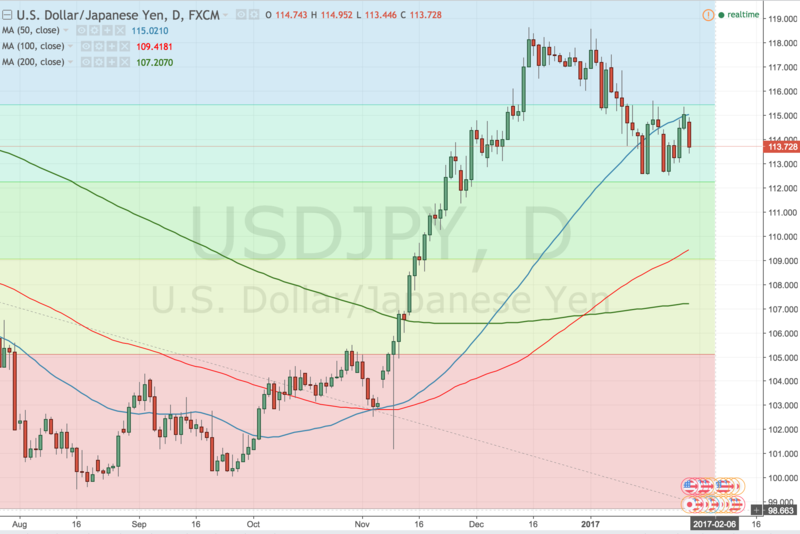 The only “good news” is that we’re still seeing higher highs and higher lows but at this point, we believe that its best to wait for USD/JPY to dip to the 200-day SMA near 112. Is EURO Still a Buy? German Chancellor Angela Merkel is widely expected to coast to victory at this weekend’s election. She is running for her fourth term (12+ years) and her position is so secure that many have looked beyond the election to her next government. Germany won’t be hit by populism as the latest polls show her party, the Christian Democratic Union and its sister party the Christian Social Union have 36-37% support with many exit polls showing last minute voters favoring the incumbent. A victory for Merkel will mean a victory for the euro. Although EUR/USD backed off 1.20 on Friday, investors are anticipating a win. In the very unlikely scenario that she loses, EUR/USD will crash quickly and aggressively and could fall below 1.18. If she wins, it will be under the backdrop of a improving Eurozone economy and a hawkish central bank. Manufacturing and service sector activity accelerated in the month of September according to the PMIs. This has and should continue to limit the slide in EUR/USD and could extend the gains for EUR/JPY and EUR/CHF. Next week’s Eurozone economic reports should continue to support the euro as we are look for improvements in the German IFO, unemployment and inflation reports. Technically, Friday’s reversal candle is more negative than positive for EUR/USD so we don’t recommend going long the currency unless it drops to 1.1850 which right above the September 14 spike low. As long as EUR/USD hold above 1.18 the uptrend is in tact but if it breaks 1.18, we could see the pair slip as low as 1.16 before finding support so traders need to be careful of overleveraging positions. GBP/USD – Buy or Sell? From a fundamental perspective, GBP/USD should be trading lower. Consistently softer UK data casts doubt on the hawkish comments from the Bank of England. Service, manufacturing and construction sector activity slowed in the June while industrial and manufacturing production turned negative. This along with a stronger pound in May caused the trade deficit to increase. The U.S. dollar should rise into and after Janet Yellen’s semi-annual testimony but traders should not diminish the significance of BoE’s hawkishness. Since their last monetary policy meeting, we’ve seen Bank of England Governor Carney join McCafferty, Haldane, Saunders and Forbes in supporting less policy accommodation. That means 5 of the 8 members of the Monetary Policy Committee could vote for a rate hike this year. Three have already done so and it may not be long before Carney and Haldane follows suit. Bank of England members Haldane and Broadbent are scheduled to speak tomorrow. We know where Haldane stands but if Broadbent joins the chorus of central bankers supporting policy normalization we could see GBP/USD rise back to 1.30. Broadbent is the longest serving MPC member and has never dissented in the 6 years he’s been on the committee. The last we heard from him, he expressed caution about the weakening pound and Brexit although these latest comments are more than a month old. If he is dovish, it would be just the excuse sterling traders need to send the pair below support down to 1.28. Technically, lower highs and lower lows signal losses for GBP/USD but Friday and today’s decline stopped right at the 50-day SMA, which holds for the time being. For the technical picture to turn negative, we would need to see GBP/USD drop below 1.2850, at which point a move down to 1.2780, the May low becomes probable. 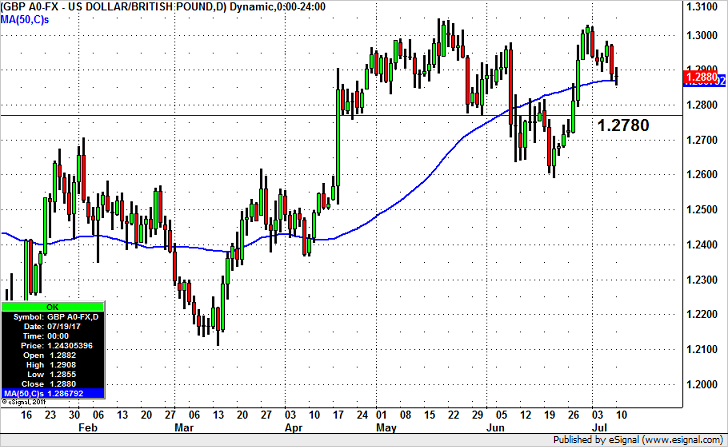 If GBP/USD holds above this level, then the pair could drift back up to 1.30. Despite a rise in U.S. yields, USD/JPY traded sharply lower today on the back of the largest one day drop in stocks since the election. With that in mind, the Dow fell only 122 points which is only 0.6%. This morning’s U.S. economic reports were mixed with personal spending beating expectations but incomes rising less than expected. We believe this decline in the dollar will temporary as the Federal Reserve is likely to reassure the market that 3 rate hikes are coming this year. Economic data has been relatively good with inflation rising. The market may be concerned about Trump’s desire to incorporate currency values into bilateral trade talks but we doubt that other countries who rely on a weak currency for growth will be willing to concede on these terms. Technically the current trend of USDJPY is negative but there is quite a bit of support below current levels. 112.50 would be a great level to buy USDJPY with a stop below 112 because if the breaches that level there is no major support until 110. On the upside, 115 is resistance. EUR/USD – Still a Buy? Its been five trading days since we’ve seen a rally in EUR/USD. Despite strong Eurozone PMI numbers, euro continued to fall as U.S. yields ticked up at a faster pace than German yields. Under normal market conditions, fact that the Eurozone PMI printed at its highest level this year should have driven EUR/USD up 50-70 pips but instead we saw a mild rally that fizzled during the North American trading session. Part of that had to do with better than expected U.S. data but at the end of the day, the currency is taking its cue from the yield spread. Tomorrow’s German IFO report is expected to be euro positive but investors will be far more interested in comments from ECB President Draghi. We still believe the EUR/USD is near a bottom but it may drop to its next support level between 1.0815-1.0825 before stabilizing – anywhere below 1.0840 would be a great place to consider fresh longs. 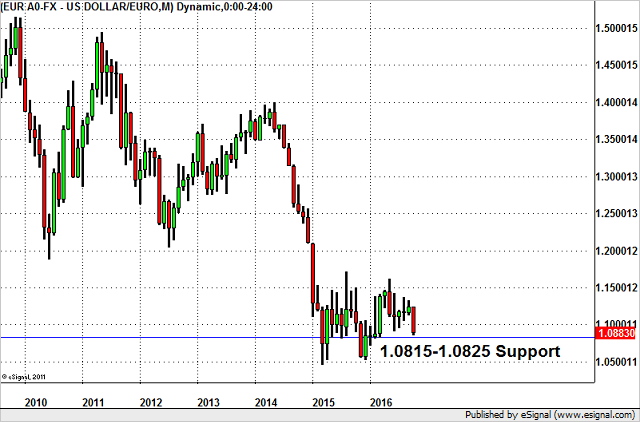 Taking a look at the monthly chart of EUR/USD, there’s significant support between 1.0815 and 1.0825, so if the currency flushes lower, a great place to add to EUR/USD longs would be near 1.0835. If it clears 1.0910, we should see a stronger move to 1.0950. Friday’s U.S. labor market report disappointed in a very big way. Only 156K jobs were created in the month of September, down from a revised 167K number in August. This sluggishness in job growth drove the unemployment rate up to 5%, the first increase in 6 months. Average hourly earnings growth increased but less than economists anticipated. Given how quickly and aggressively USD/JPY appreciated, Friday’s report triggered profit taking because as things stand the Fed won’t be able to justify a December rate hike if NFPs fail to rebound to 200K or more next month. Fundamentally we expect USD/JPY found its way below 102.40 and even down to 102. However if USD/JPY gets down to 102 it becomes an attractive buy because the Federal Reserve will still be raising interest rates and December remains an option – we just need to shake out some longs before that happens. Technically 102 is an important support level for USDJPY but the main area of support is closer to 101.70, where the 50-day and 20-day SMA converge. On the upside, 104 will cap gains for the time being. 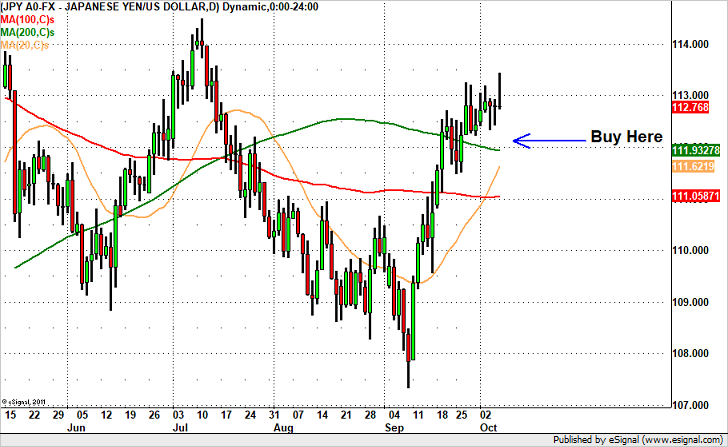 The question that we are getting asked the most today is whether EUR/USD is a buy. The currency pair spent the whole week in consolidation mode within a narrow 80 pip range before finally breaking lower on Friday. The move was driven by U.S. dollar strength and risk aversion. Fundamentally, the question of whether EUR/USD is a buy all hinges on the FOMC meeting and not EZ PMIs. 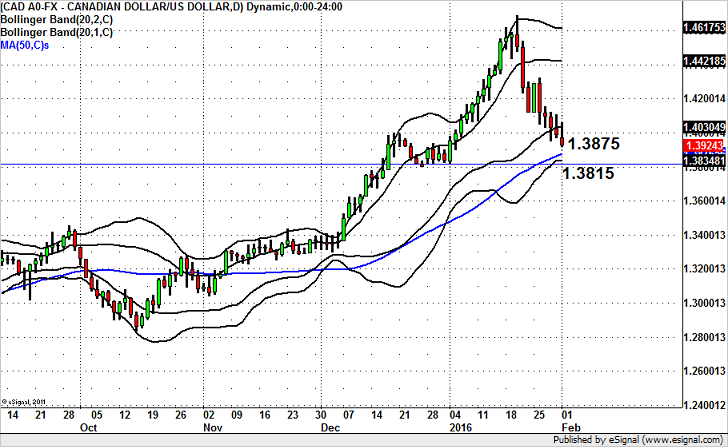 If the dollar continues to rise going into FOMC (and it may) EUR/USD could drop to 1.11. Ultimately we think Janet Yellen will set the stage for December tightening and this view makes buying EUR/USD at these levels difficult. Technically however the currency pair is still holding above the 200-day SMA near 1.1145, which is the level to watch next week and it is testing the 50-day SMA. It may be worth buying EUR/USD at current levels with a stop below 1.11 for a punt because if it drops below 1.11 then there’s no support until 1.10. USD/CAD – Buy or Sell? USD/CAD -- Buy or Sell? 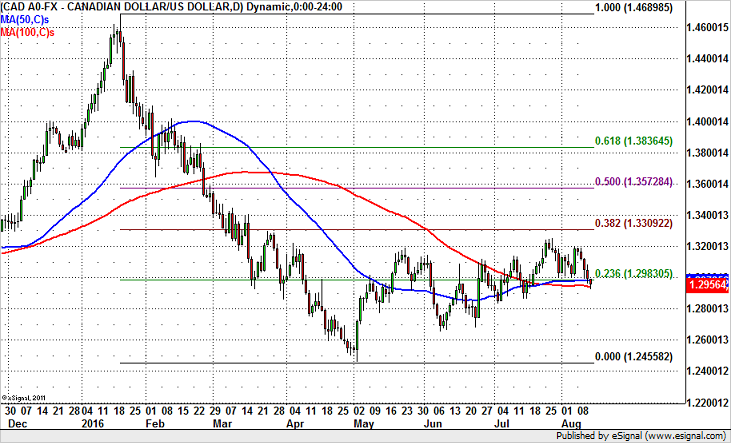 Fundamentally, USD/CAD should be near a bottom. Oil prices have had a strong run and the move has taken the commodity to the 100-day SMA. This means oil is near a peak. Considering that crude prices has been the primary driver of CAD flows, a reversal in oil would mean a rally in USD/CAD. Canadian data has also been terrible with employment and trade conditions weakening. Chances are next week’s retail sales report will be soft as well. However technically, the recent decline in USD/CAD has taken prices below the 50-day SMA and the 23.6% Fibonacci retracement of this year’s decline which signals the possibility of a steeper drop towards 1.28. A close below the 100-day at 1.2940 would be needed to confirm the renewed downtrend. So how do we trade USD/CAD? The best tactic is to wait for confirmation because when USD/CAD turns it is typically a multi-day affair, so there’s no need to “pick” the ultimate bottom. 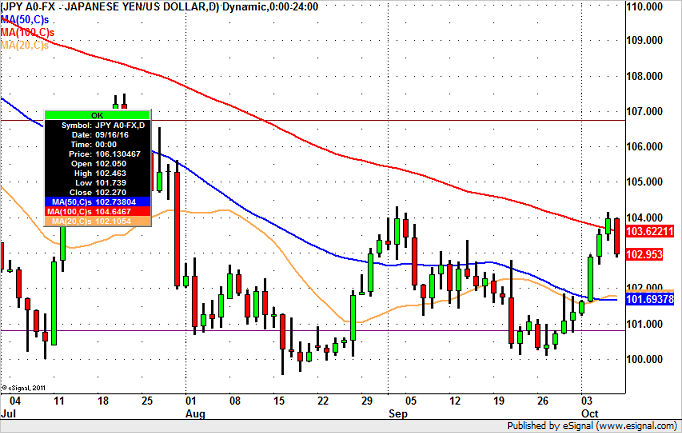 If USD/CAD closes below 1.2940 in a meaningful way, then its headed for 1.28. If it rises back above 1.30 however, then the next target will be 1.32. Last week’s surprise decision to cut interest rates was a major announcement for the Bank of Japan -- one that we believe will have another 200 to 300 pips of continuation. Friday’s move stopped right at the 200-day SMA so a deeper retracement is possible and we want to use that opportunity to buy USD/JPY at a lower level. The BoJ not only lowered interest rates, but also pushed out their timeline for reaching their inflation target and warned that more actions could be taken including changing the quantity and quality of asset purchases as well as cutting rates further. Since the BoJ did not increase the size of its QE program this could be the next option if the economy weakens further but adopting this radical form of monetary policy is a sign of the country’s desperation. They are finally recognizing the negative impact that volatility in the financial markets, the sharp decline in inflation and the slowdown in China will have on Japan’s economy. Looking ahead, the yen should be sold on rallies. Many investors are confused today about why the 6% drop in oil prices today failed to send the Canadian dollar sharply lower. Instead, USD/CAD closed firmly below 1.40 and appears poised for a move down to 1.38. Apparently there was heavy selling by leveraged funds, which may continue. However when USD/CAD diverges this much from oil on a day where the U.S. – Canadian 2 year yield spread moved in favor of USD/CAD gains, we can’t help but view this as an attractive buying opportunity. The biggest risks for the Canadian dollar this week are the regularly scheduled weekly oil inventory data and Friday’s employment report. Technically USD/CAD has entered the sell zone according to our double Bollinger Bands and this means we could see a bit more weakness in USD/CAD. 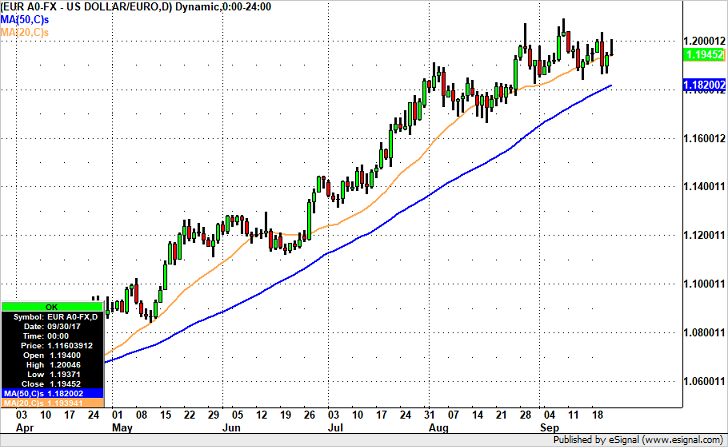 However the first level of support comes in at the 40-day SMA near 1.3875. This would be the first place that traders could potentially buy USD/CAD. The better level would be slightly above 1.3815, a level that served as support for the currency pair on many occasions in late December.